The Road Haulage Association (RHA), British Vehicle Rental & Leasing Association (BVRLA), Freight Transport Association (FTA) and National Franchised Dealers Association (NFDA), are concerned that local authorities are rushing through CAZ plans with scant regard for the hauliers on whom their local economies depend. This is despite the haulage industry nearly halving its NOx emissions in four years. The trade bodies this morning met with Transport Minister Jesse Norman and Environment Minister Therese Coffey, to discuss a joint six-point plan for Clean Air Zones. 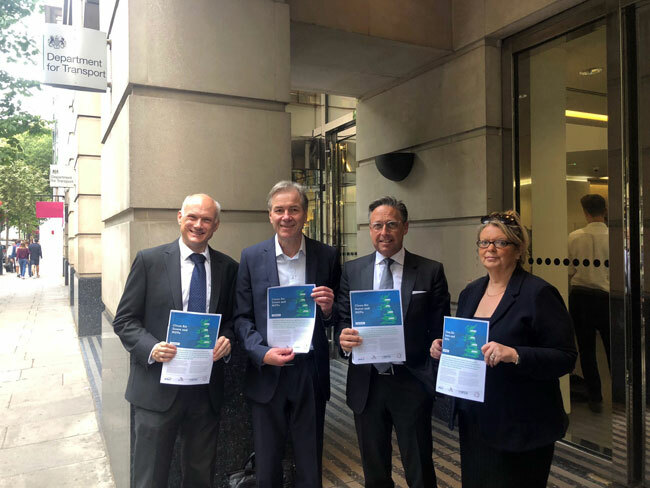 The plan – 'The Way Forward' – sets out recommendations these four trade bodies believe can help improve air quality whilst protecting haulage from punitive charges and bureaucracy. The plan calls for consistent CAZ operating standards, smarter use of road space, and a phased approach supporting the transition to cleaner vehicles that doesn't put operators out of business. RHA chief executive, Richard Burnett said: "We welcome Government's commitment to improve air quality but local authorities pricing lorries off the road is not the way to go about it. Ministers confirmed in our meeting earlier that local authorities should consider all options and that charging should be a last resort. They also highlighted that it is up to local authorities to decide which vehicles would be charged, when charges should apply and the level of charge. If Clean Air Zone are not handled properly we will have more vans making deliveries, congestion will increase and so will pollution. Clean Air Zones will only reduce emissions if they target polluters proportionately." BVRLA Chief Executive Gerry Keaney said: "The fleet industry can help Government to meet its air quality ambitions but we need more support for HGV operators who face particular cost and operational challenges in upgrading their fleets. We rely on commercial vehicles accessing towns and cities for deliveries and any Clean Air Zone policy that deters trucks is likely to increase the usage of vans. 99% of our members' LCV fleet is diesel so any initiative that increases the number of vans on our roads will not tackle pollution levels. Commercial operators need time and incentives to upgrade their fleets." Sue Robinson, Director of the National Franchised Dealers Association (NFDA) commercial Vehicle Division comments, "It is essential that we encourage operators and logistics companies to move to trucks with cleaner engines. Progressive action is needed to ensure that operators can improve their vehicle fleets, not just by purchasing new Euro 6 commercials, but also by upgrading to cleaner Euro 5 used trucks to replace old and dirty diesel HGV's. This is why it is important that a graduated CAZ levy charge is introduced in order to encourage all hauliers to do their bit in improving air quality". FTA chief executive David Wells said "Placing all the burden on local areas to accelerate air quality improvements risks the livelihoods of many small business around the country. Government must help local authorities avoid the most damaging effects on the local businesses that use trucks or vans."